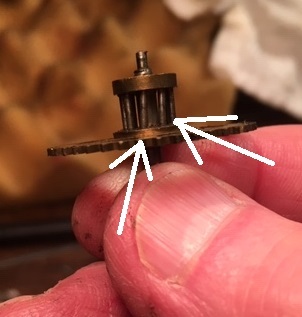 The movement was dirty with very thick/old oil around most of the lantern pinions and pivots. Upon further inspection there were 13 pivot holes that were worn. There were a few that were very worn. Check out these two videos showing the wear. Video 1 shows the front side of the movement and video 2 shows the back. This was a must to this repair. Here is a picture of the movement completely taken apart. Lots of pieces and parts. After all the holes that needed rebuilding were marked, the plates were taken apart. Examining all the lantern pinions and pivots showed one lantern shroud (or brass top) became loose over the years. The shroud lifted up. The trundles (pins) were not secured between the top and bottom shrouds. 3 pins looked crooked. The pins were OK, they just were not attached on one end. This could have caused significant damage to the movement if they fell out. Luckily, they did not. Here is a picture of the lantern pinion. This picture was taken before cleaning and before work was completed. The arrows show the crocked trundles. The brass lid or shroud has moved upwards causing the trundles to shift. One end of the trundles are not engaged with the top shroud. Very dangerous for the clock. The repair of this condition is to line up the trundles with the shroud then pressed down so the trundles fit in side the upper holes. The pinion would then be solid again. Here is a picture of the completed repair. 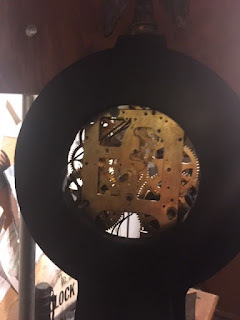 This picture also shows how dirty the clock parts were. I mentioned that my standard repair habits are to inspect all the pieces and parts of all the wheels. I also inspect all the pivots. If a pivot is rough, I chuck the wheel in a lathe and polish the pivot. There were 5 pivots that needed polishing. The mainsprings were checked and noticed that there was a little sticky old oil on the springs. Steel wool was used to clean off the sticky oil. 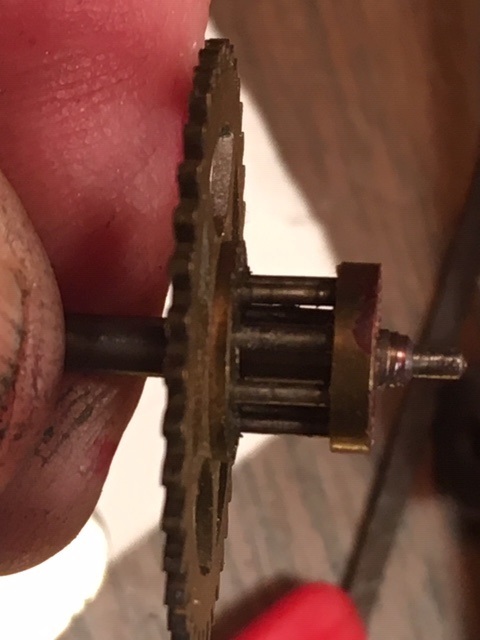 The click spring on the time side was not completely attached. 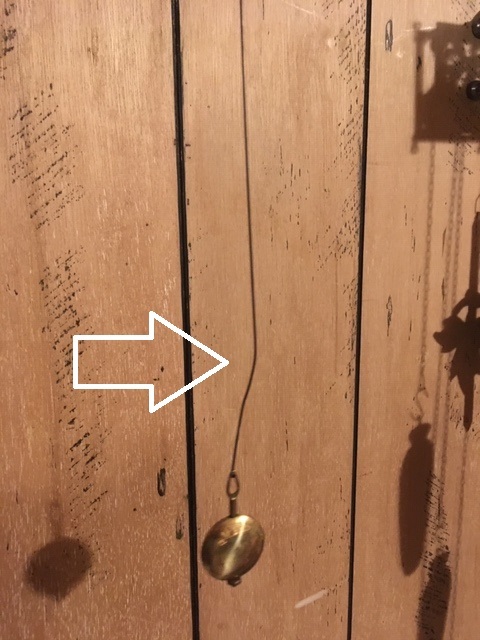 The brass hook was not letting the spring seed itself in the proper place. This was adjusted and now the spring is secure and in the correct position. The next step is to repair the warn pivot holes. This picture shows the bottom plate in the bushing repair tool. 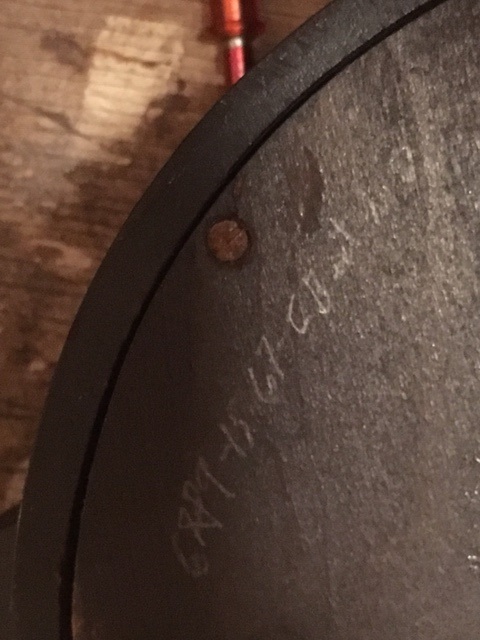 Note all the worn pivot holes were marked both inside and outside the plates. To select the proper bushing the pivot is measured so that the bushing is selected so the pivot fits perfectly. The plate is measured for thickness. I do not want a bushing to be sticking outside the plate significantly and last but not least, the outside hole is obtained to pick the correct cutter. Here is a short video of the results of my repair work. This is the 2nd wheel on the time side train. Both pivot holes are rebuilt and sized to the correct diameter for the wheel pivot. Notice how smooth the wheel slides between the holes. Here is a picture of the movement although in pieces after a visit in the ultrasonic cleaner. Nice and shinny. Ready to be put back together. The clock is back together. It's nice when your done there are no "extra" pieces. Follow this link to see the movement back together running. Unfortunately when I took this video, the movement was getting ready to strike. I could not actuate the strike for the video. This video was taken after the clock ran seamlessly for 24 hours dry. I run the clock for a short time dry, just in case I needed to do more adjusting or split the plates for an internal adjustment. No problems. After 24 hours and all is well, the next step is to oil all the pivot holes and escape wheel teeth with hi-grade clock oil. I also attach all the tension springs for the strike hammers and warning and stop levers. Examining inside the case shows that a repairman did some work in the clock on October 22nd, 1937. Interesting about the repairers signature and that he signed the case in two places. Here are two images of the repairers signature. This one is on the back of the case at the bottom. This signature is inside the case. The rod hanging down is the pendulum suspension rod. The case and glass has been cleaned and oiled. The next step is to put the movement back into the case for further testing. The next 2 images demonstrate the movement in the case hanging on a custom test stand. This stand is great for adjusting the suspension crutch while it is hanging on the wall. The bezel was loose and the glass ring was loose. Both were tightened. After making sure the clock runs correctly. 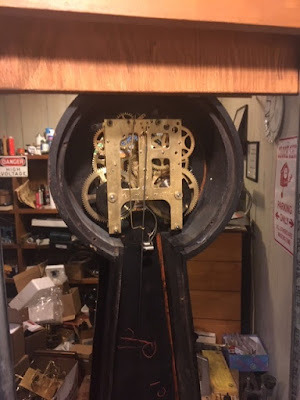 The suspension rods will be installed, clock face, and hands. The back will be installed and finally the pendulum length will be adjusted so that the clock keeps proper time. The clock is all back together. Running great. The clock is complete and ready to go back to it's owner! A job well done.